WORLD GUITAR DAY 2018: Guitar gear terminology can be oddly impenetrable. Even in the more belt-and-braces world of acoustics, there's enough jargon to make a newcomer's head spin. 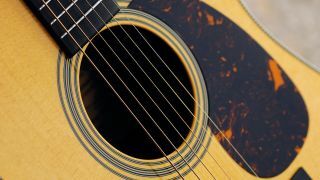 In an effort to demystify the process, we've collected and defined some of the key terms used in relation to acoustic guitars. This describes the point at which the neck heel is joined to the body. The position has an affect on how rigid the neck is, the position of the bridge on the soundboard and, as a result, the tone of the guitar. Most modern acoustics use a 14-fret join and 12-fret acoustics tend to be a smaller variety. Pretty self-explanatory, but it’s important to point out that the construction of tops, backs and sides falls into two main types: solid and laminated. Solid means they’re made from single pieces of wood while laminate is made of wooden sheets layered on top of each other. It’s generally believed that a solid piece of wood vibrates more effectively than laminate. But it usually contributes to a higher cost instrument and it’s not always the case that solid wood guitars will sound ‘better’ than ones with laminate back and sides. The assembled body of an acoustic guitar consists of three areas - the upper bout (sometimes referred to as the treble bout), the lower (or bass) bout and the waist bout that divides them. The internal structural wooden reinforcement on a guitar’s top and back internally. It has two primary roles: it keeps the guitar together and prevents it from collapse under the tension from the strings, while the top bracing helps to determine the guitar’s sound. A common example of bracing is the ‘X’ pattern, invented by Martin in the 20s and sitting behind the soundhole with additional ‘tone bars’ behind the bridge. Though bracing is often made from spruce, adirondack is another preference. And the bracing itself can have variations included scalloping and tapering to affect weight, volume and response. An indentation, usually a scoop, near the neck in an acoustic’s upper bout on the treble side that allows access to the upper frets. It’s especially popular with lead players transitioning from electric guitar. Styles of cutaway include Florentine (comes to a sharp point), Soft (flatter slope) and Venetian (rounded lines). Also known as a piezoelectric, pickup are different to the magnetic single-coil and humbucker types found on many electric guitars, which can also be retro-fitted to acoustic soundholes. Magnet pickups sense the vibrations of the string but a piezo sense the vibrations of the body itself. A piezo is usually fitted in a cavity beneath an acoustic guitar’s bridge saddle that is subject to the vibrations of the guitar. It then converts those vibrations into an electrical signal that’s processed by a preamp. A pre-amplifier processes the signal coming from the acoustic’s pickup or microphone for amplification. Preamps can come loaded with various controls to shape your tone or none at all, including three-band EQs, phase switches and notch controls. They’re usually active and powered by a replaceable battery. A decorative border that is inlaid around the top and sometimes the back plate and strip of an acoustic. This can be in addition to plain or coloured binding. A decorative band surrounding the soundhole of an acoustic. Abalone (sea snail shell) is a popular material used for them. A guitar’s scale length is calculated by measuring the distance from the front edge of the nut to the centre of the 12th fret, and then doubling that measurement. Scale length preference depends on taste but can influence tonal and playing character; a longer scale length around 647mm (25.5") can help define the low end, while a short scale length may have lower tension and feel easier to play. The acoustic guitar’s top and, in essence, its speaker cone. The soundboard transmits the vibrations of the string to the air and in combination with the bracing, plays a crucial role in the tonal quality and projection of the guitar. It is often made from solid wood and quarter sawn spruce is a popular choice. This is a hole in the soundboard - usually round in shape - that allows air pressure to be balanced so that the soundboard can freely vibrate. A steel rod that runs through the neck under the fretboard of a guitar. The truss rod helps counteract the tension from the strings and can also be adjusted, affecting the curvature of the neck. This may be needed after changes in temperature from seasons and internal and external use that can cause the neck to become bowed. Some early Martin acoustics didn’t have truss rods and nylon-string guitars don’t tend to have them because they’re not subject to the kind of tension found with steel-string acoustics.